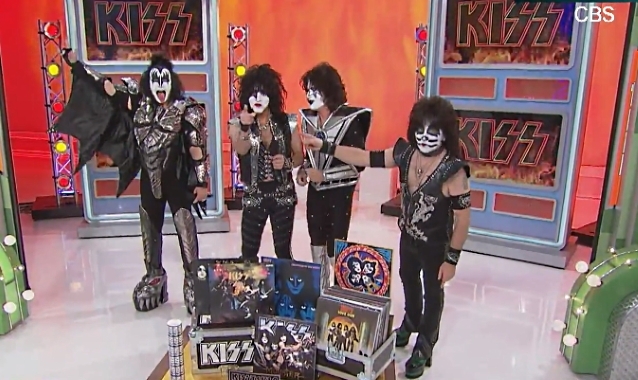 Legendary rockers KISS will appear on "The Price Is Right" on Monday, February 4. A clip from the episode, which was filmed on December 3, 2018, can be seen below (courtesy of ET). In honor of the 2019 Grammy Awards, airing Sunday, February 9 on CBS, "The Price Is Right" is hosting a week of shows celebrating music. Each day, the show will be themed for a different genre, starting Monday with KISS and rock and roll. The iconic band will model a special prize package featuring their farewell tour and present a musical showcase. "The Price Is Right" airs weekdays on CBS. Check your local listings for more details. In September, KISS announced its "End Of The Road" farewell tour on NBC's "America's Got Talent", and a month later, the band revealed the first set of dates and cities in North America, produced by Live Nation. International markets were announced simultaneously. The first North American leg of "End Of The Road" will launch January 31 in Vancouver, British Columbia, Canada at Rogers Arena and will hit an additional 43 cities. The touring lineup features the current version of the band — guitarist/vocalist Paul Stanley, guitarist Tommy Thayer, bassist/vocalist Gene Simmons and drummer Eric Singer.